Micromax A110 Canvas 2 became one of the best selling smartphone in India, Micromax now officially launched a new smartphone in this series called A116 Canvas HD, priced for below Rs. 15,000. It equipped with MediaTek’s MT6589 1.2 GHz quad-core processor and runs on Android 4.1 operating system. 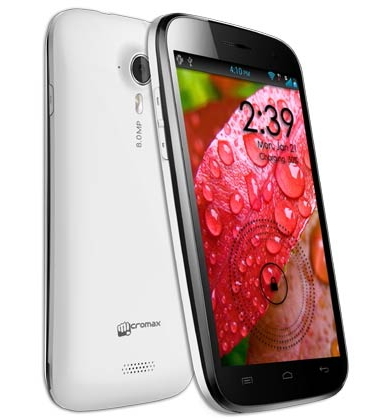 This is the first Micromax smartphone powered by quad-core processor. It features 5-inch IPS touch screen display with resolution of 1280 x 720 pixels. The phone comes with 8 megapixel rear camera with LED flash and VGA camera at front. It has 1 GB of RAM, 4 GB of internal storage and micro SD allows users to expand up to 32 GB. It sports with 2100 mAh battery. At Micromax, we constantly strive to innovate and develop great technological experiences for our consumers. Today's launch marks our association with MediaTek to bring forth our first quad core phone in this segment, offering consumers a great user experience with latest features and added functionality." and "We are excited with the success of Canvas 2, which has clearly established Micromax as number one player in the new 5-inch phablet category in India. We are looking forward to similar success with the new phone being unveiled today."